Partition loss or file loss can be the most undesired and unpleasant situation that computer users can meet with. The situation is much complicate when users need to perform deleted partition recovery or recover files from deleted partitions. In such situation, neither partition nor files in the partition can be seen in My Computer. Not only files are marked as deleted, but also the all sectors taken by the partition are marked as Free from partition table. Disk space marked as “Free” is ready for storing new files, so deleted files or partitions are likely to be overwritten. Actually, deleted files and partitions are not erased totally before they are overwritten by new files, thus deleted partition recovery is quite workable before file overwritten, and users can recover deleted partitions or recover files from deleted partitions on their own. Perform deleted partition recovery for free. If you have backups of deleted partitions, then you can get the partition restored as easy as blowing off dust. If partition is deleted before backing up, then keep reading. As partition information is saved in partition table, it is easy to recover deleted partition by dint of rebuilding partition table with effective deleted partition recovery software. PartitionGuru Free is powerful partition recovery program that supports recovering deleted partitions and repairing partition table. Besides, it can recover data from formatted, lost, damaged, corrupted, inaccessible partitions. The whole partition recovery process is simple and can be obtained by common users who don’t know well about computer skills or professional knowledge. 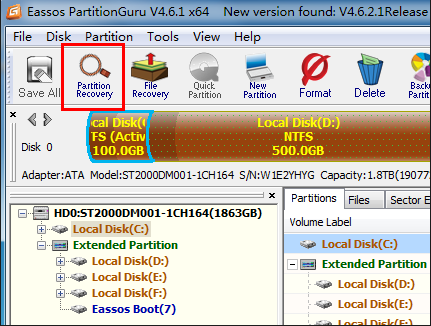 The function for recovering deleted or lost partition can be found on the main interface, which can be started by the button “Partition Recovery”. This entry was posted in Data Recovery, Partition recovery and tagged deleted partition recovery, partition recovery, partition recovery software, recover files from deleted partitions by EASSOS. Bookmark the permalink.